Of the songs heard during the credits following the acclaimed 2014 Ava DuVernay film "Selma", one of them, performed by John Legend and the rapper Common, won an Academy Award and a Golden Globe award. But another track in the credits features the very voice of the marchers. Their songs of hope, defiance and unity were directly captured and documented by a man who carried a large tape recorder under his coat. Carl Benkert was a successful architectural interior designer from Detroit. He had come down South in 1965 with a group of clergy. They were to take part and bear witness to the historic march for voting rights from Selma to Montgomery, Alabama. In addition to his camera, he brought a bulky, battery-operated reel-to-reel tape recorder to capture the history all around him, in speech but also in song. In their struggles to make a stand against inequality, Benkert wrote, "music was an essential element; music in song expressing hope and sorrow; music to pacify or excite; music with the power to engage the intelligence and even touch the spirit." "I was really pretty thrilled," said Catherine Benkert, when she learned that her father's recordings were in the film. "I told everybody I knew. He would have been thrilled, too." The elder Benkert died in 2010 at 88. He had been a lifelong amateur audio documentarian. "He made a point of being at some of those important junctures of the 20th Century," says family friend Gary Murphy. "He made a recording of the last steam engine trip that went between Pontiac and Detroit - in stereo," Benkert adds. "And that was back when stereo was brand new." Why did he go to Alabama? "Dr. King called for people to come and he felt moved to do it," she said. While in Alabama, Benkert and others from the Detroit area were enlisted to be night watchmen for the marchers. Their job was to keep sure things remained safe overnight, she said, "making sure nothing was happening there." In the daytime, Benkert had his tape recorder at the ready. He kept it behind an overcoat that cloaked it from police or angry whites. Songs rose frequently. "He told me that when people were scared down there, people would sing," Murphy said. The track used in "Selma" was a percussive-heavy medley of "This Little Light of Mine / Freedom Now Chant / Come by Here". It was recorded at Zion Methodist Church in Marion, Alabama. It is the church where Jimmie Lee Jackson was beaten by troopers and shot by a state trooper while he was participating in an earlier peaceful voting rights rally. The killing inspired the Selma-to-Montgomery march for voting rights. The march culminated at Edmund Pettus Bridge across the Alabama River a month later. An evening mass meeting was held on March 18, 1965. It was at the church where Jackson had been a deacon and "was attended to overflowing by residents and visitors who had spent the day working in the counties north of Selma," Benkert recalled in the liner notes in his album. In the medley, the familiar, optimistic song of determination, "This Little Light of Mine," driven by percussive clapping, shifts to the familiar and still heard "Freedom! Now!" chant, before the entreaty for heavenly support: "People are suffering, Lord, come by here/ People are dying, my Lord, come by here." For Benkert, traveling to Selma in those charged times provided the opportunity "to see life in a vital totality never otherwise experienced," he wrote. It was a moment that permanently affected him, judging from his comments on the Zion Methodist mass meeting. "Participating in 'We Shall Overcome' is always a moving occasion for the spirit," Benkert wrote, "but this was for the few outsiders present, the most powerful and electrifying, yet experienced." 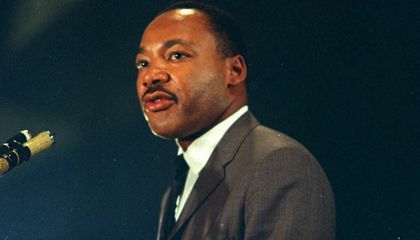 And a number of his recordings of speeches, particularly by Martin Luther King, have had historic importance. Benkert made the only known recording of a May 31, 1965, King speech that came at the end of the march to Montgomery, that had grown to 50,000 people during its five days. In it, King told supporters at Brown Chapel in Selma, "Equality is more than a matter of mathematics and geometry. Equality is a philosophical and psychological matter and if you pluck me from communicating with a man at that moment you are saying that I am not equal to that man. "Let us not rest until we end segregation and all of its dimensions," King said. Benkert donated the bulk of his recordings and papers to the University of Michigan. Royalties for the Selma recordings still come in, his daughter said. "To be still in print after 50 years, it's got to be part of the fabric of the whole American story," says Murphy. "It will probably never go away." And the attention of the "Selma" movie likely brought new audiences to the original recordings, Catherine Benkert said. "His whole thing, with any of his recordings, was: he wanted people to hear them." Why did the film "Selma" use the very voices of the marchers? The original voices from the marches were used in the movie because it was more emotional and showed many people that there print of the original American story. "His whole thing, with any of his recordings, was: he wanted people to hear them." says Murphy. She is saying that people still want to hear the original footage, it gives them some hope that racism may go away one day. According to the article ¨More Than 50 years old, freedom songs still inspire today,¨ in the film ¨Selma,¨ they used the very voices of the marchers. Based on the text, it gives me the clues that the original voices were used to make it more believable and historical. Finally, I know why the director of the film ¨Selma¨ used the very original voices of the marchers. "Selma" used the voices because they captured the soul of of the marchers, and because it was an important part of history. The film "Selma" used the very voices of the marchers because they took part and witnessed the historic march for voting rights from Selma to Montgomery,Alabama. i think The original voices from the marches were used in the movie because it was more emotional and showed many people that there print of the original American story. "His whole thing, with any of his recordings, was: he wanted people to hear them." says Murphy. She is saying that people still want to hear the original footage, it gives them some hope that racism may go away one day. In the story freedom songs still inspired today. It talked about an African American man name martin Luther king Jr. when he went to Montgomery Alabama they marched to get racial equality. When marching they sang songs that expressed what they were felling. Martin Luther king Jr said when people sang the song Murphy said the people where scared. I like this article I liked learning more about Martin Luther king Jr and about the songs the sang at the marches. This article is about how the creators of the movie Selma use the voices of the of the people marching. I think the movie Selma used voices of the marchers to show the emotion of the marchers. She says in the article that people today want to hear the footage because it gives them hope that racisms will end. "selma" the film use the voices of the marchers to get people to get along with each other. this was a important part of history. It showed people about the way the world was then. Selma used voices of the marches because, the creator wanted to show the words and emotions being felt during the march. They wanted to show the affect the words had on one another. Also the creator wanted to establish the a story behind the words that came out of their mouths, unfairness, racism, cruelty, self love, and respect to one another. The words being spoken were suppose to be felt and words to make you think. Lastly because, it was part of an American Historic disagreement that had a lot of effects on our lives in the past, today, and the future.